You just got report from outgoing nurse about Mrs Troponin, a 53 years old female who was admitted for GI related issues. On assessment, Mrs Troponin tells you that she feels like she is having indigestion but her chest feels tight with left jaw discomfort. As a smart nurse, you immediately notify the doctor and he orders cardiac biomarkers to rule out acute myocardial infarction and STAT EKG. EKG results are instant and you have a print out of 12 lead EKG in your hands ready to call the doctor. The doctor asks you what the EKG shows over the phone. Do you know what to look for to determine if Mrs. Troponin 12-lead ECG is abnormal? Could you recognize signs that she’s having a myocardial infarction (MI)? How about heart blocks, all of them? If you can independently interpret a 12-lead ECG, you can anticipate and prepare for the emergency care your patient may need. In this article, I’ll cover the basics of 12-lead ECG interpretation,focusing on a normal ECG. Once we are clear with the normal EKG, we will look at abnormal EKG and how to interpret. To understand the normal EKG, you must understand the heart contractile process, the electrical pace makers, and electrical pathways all the way to the ventricles. Since my goal is EKG and not cardiac anatomy, I will only focus on what is happening at what point. Maybe we can re-visit cardiac anatomy in future. The contraction of the heart begins at sinoatrial node (SA node) located on the right atria (also called the natural pace maker). The SA node fires between 60-100, hence the normal heart rate of a human being. All contractions must start from SA-Node for us to call a rhythm as a Normal Sinus Rhythm (NSR). On EKG, the firing of sinoatrial node is indicated by P-Wave on EKG. Got it? After the SA-Node fires, the electrical impulses travels down to atrial-ventricular node (AV-Node) located between the atria and the ventricles, hence the name— atrial-ventricular node (AV-Node). This causes the atria to contract (depolarization indicated by the P-Wave on ECG). The time the impulse take to travel from SA node to AV node in EKG is indicated by P-R interval (0.12-0.2 seconds). The AV node holds the impulse briefly allowing the ventricles to fill with blood. HINT: To understand abnormal EKG, you must remember the time each process takes. There is no way around this. 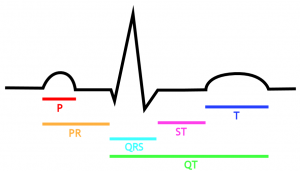 You also need to know that a QRS complex must be preceded by an upright P-Wave and a PR interval lasting between 0.12-0.2 seconds and not longer. A P-wave must always face upwards in a normal EKG, not downwards. We’ll talk more about this when talking about abnormal ECG. Back to the AtrioVentricular node where we said it delays the impulse and gives time to let the ventricles fill with blood after atrial contraction. Assuming that you know your cardiac anatomy, the impulse travels from AV-Node through bundles of His and down to Purkinje fibers. There is left and right bundles, something you also need to know to understand bundle branch blocks (BBB) coming soon. The bundle branches are high speed conduction fibers and connects with Purkinje fibers.The moment the impulse leaves the AV node, ventricular contraction begins. Since these are high speed fibers, the ventricular contraction takes 0.06-0.1 seconds indicated by QRS complex. Got it? HINT: If there is an issue with either right or left bundle of His, the QRS contraction takes longer than 0.1 second, indicated by a wide QRS. Any time you are looking at a 12 lead EKG and QRS is greater than 0.1, you automatically know there is a bundle branch block. We will talk more about how you tell if it is right or left from an EKG. The QRS is followed by a T wave. 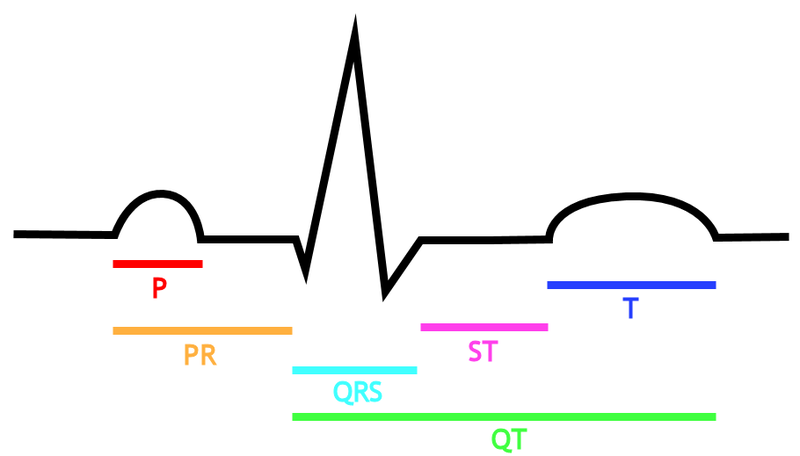 Between the T wave and the end of QRS (S-section) is the S-T segment. This is a very important section of an EKG because it indicates the oxygenation of the myocardium and potassium levels. Peaked T wave indicates high potassium level. When myocardial cells are injured,the ST segment often is elevated above the baseline. So ST segment elevations are a key indicator of MI. Depressed ST segment may indicate old myocardial infarction.Myocardial ischemia (temporary and reversible) often results in an ST segment below the baseline of the ECG tracing. HINT: You must know the baseline of an EKG tracing and notice the height of each wave. You also should know what parts of EKG can show you life threatening events are imminent.— ST segment. In the next article, I will go through the leads and which leads you should look at to detect MI. Assuming that Mrs Troponin was having MI, and as a good nurse, you remembered MONA. What is the rationale of using Morphine? How well do you understand bundle branch blocks? How many abnormal Rhythms do you know? List them on comments section of this article and we will discuss them later. can you send me a copy of this to my email address? You can print the article directly from the site. I will make it possible to download a PDF version near future. Please continue to post.Thank you. This is good. Comprehensible illustration. Thanks. very informative article, and I like your style of writing that you make it so interesting. I too, would like to have an email copy. Tks so much, looking forward to the remaining article. You can print the article if you like. I will make it possible to download a PDF version near future. wow! this is indeed very helpful. Please continue posting nursing concepts. Thank you. Am I right that MONA stands for Morphine, Oxygen, Nitroglycerin, Aspirin? I don’t remember it much. Thanks for the answer. if there’s a good article about the correct placement of the leads….!? This kinds of post is helpfull …it keeps us updated…. Yes, The reason we give morphine is to decrease oxygen demand in the heart. 1. Morphine decreases O2 demand and helps with pain. MONA- morphine, O2, Nitroglycerin, and Aspirin. 3. Sinus tach. (>100 bpm) , Sinus Brady. ( 0.2 sec. ), Atrial flutter ( look for “flutter” waves or saw tooth like waves), Atrial Fib. I know there are more but I am having trouble remembering the ventricular rhythms. For some reason all the junctional rhythmsand the info on PAC’s I posted did not show up. Junctional rhythms either has an inverted P wave, a non visible P wave, or a P wave in the QRS complex. The bpm’s help distinguish between junctional( 40- 60), accelerated junctional(60-100), or (> 100) junctional tachycardia. OH yeah, thanks again! I love to review this stuff! I’d LOVE to see this as a PDF! Thank you for posting this very thorough series of articles! great info with 12 leads!! idio ventricular, a-fib, a-flutter, juntional bradycardia, sinus arrest, etc…..